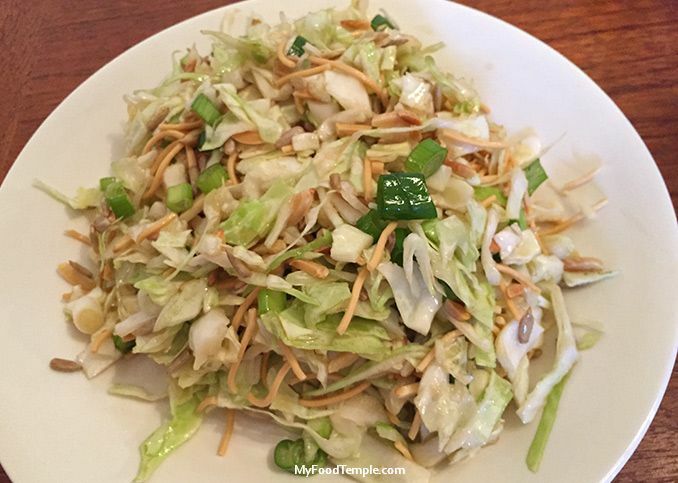 This crunchy cabbage salad is so good it makes me salivate. There’s something about delicious toasted almond slivers with crunchy sweet cabbage slivers and a smattering of sunflower oil, brown sugar and vinegar that makes my taste buds go completely insane. I love this salad more than chocolate. The fact that it consists primarily of green cabbage is an absolute bonus for health. Whenever I make this sweet crunchy salad it gets showered with compliments like “oh god that is good”, “can I have the recipe ?” “this is really delicious”. This cabbage salad is like the Melbourne Cup champion of salads. If I sound a bit gushy its because I’m a little infatuated and have been for a very long time. I’ve been making this dish for a couple of decades now (god I sound old) and I just adore it as much as ever. I find it best eaten alone as a main meal, either lunch or dinner, or served as a side dish at a BBQ with family and friends. Yum! I think I have to make it again this week now. I really shouldn’t talk about it too much or I’ll start to drool. Pour sunflower oil, followed by brown sugar, followed by vinegar and soy sauce into a glass jar to mix - put on lid and shake it to mix thoroughly when ready to serve. HOT TIP: For full flavour and full zing: place dressing ingredients in glass jar, but don't shake and mix the dressing ingredients until immediately before serving. TIME-SAVER TIP: Some supermarkets sell a bag of fresh pre-chopped cabbage, spring onion and carrot. It saves time on slicing yourself.